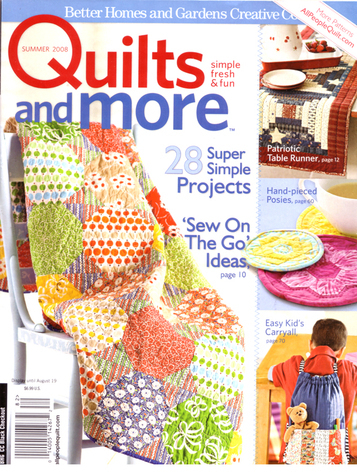 Been wanting to tell you about the Quilts and More summer issue featuring "Flirty Skirts". 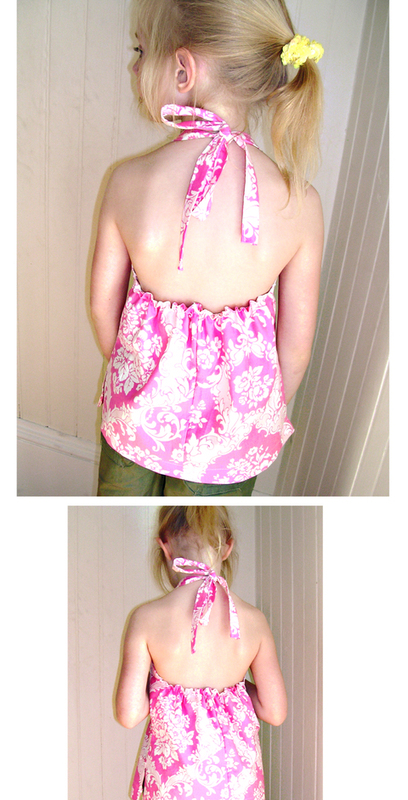 Almost the same as the ruffled skirts but I actually sized them up and down a couple of sizes to fit bigger and littler girls. I love that picture, that little cupcake on her tippy toes, sweetness. I almost forgot about the article it until I came upon this site last night. 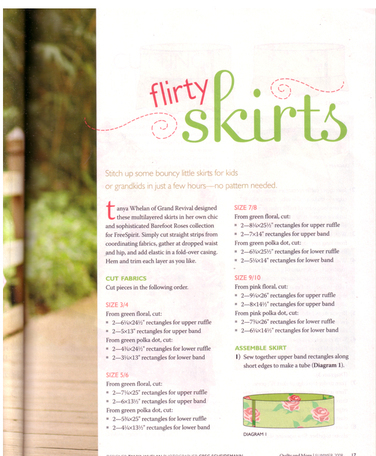 I love the idea that this girl in Finland might be making some Flirty Skirts for her little one. Also, found this today which I also thought was cool. I don't know, seeing my stuff up on the Coats (parent company to Westminster, which is the parent company to Free Spirit, the company that manufactures my fabric) Spain site just seems exotic. 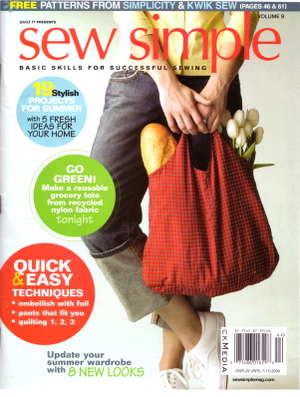 And Sew Simple has an article on my "beach balls" made up in Barefoot Roses. 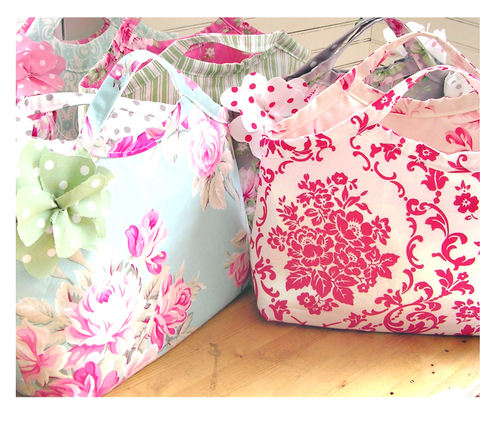 They have a couple of super cute bag patterns in that issue as well. 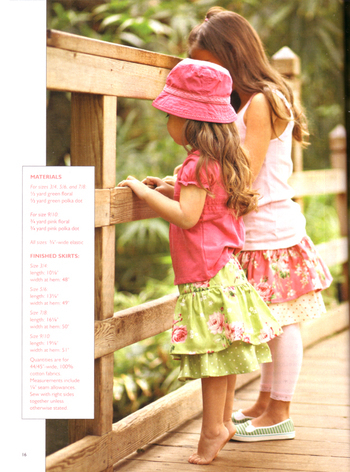 Back to work, finishing up patterns and working on French Hatbox strikeoffs, not easy with 3 kids at home. I can't wait for day camp to start....Happy summer all!!! Just a little weekend sewing. I did decide to get a new machine, WHY DID I WAIT?!?! I know why, cause I'm cheap...but I am soooo happy with the new machine. No more is my thread breaking every two minutes for no apparent reason, maybe because the new thread holder thingy lies on it's side, it doesn't get caught under the spool anymore? Don't know, but I am happy as can be with my new gadget. 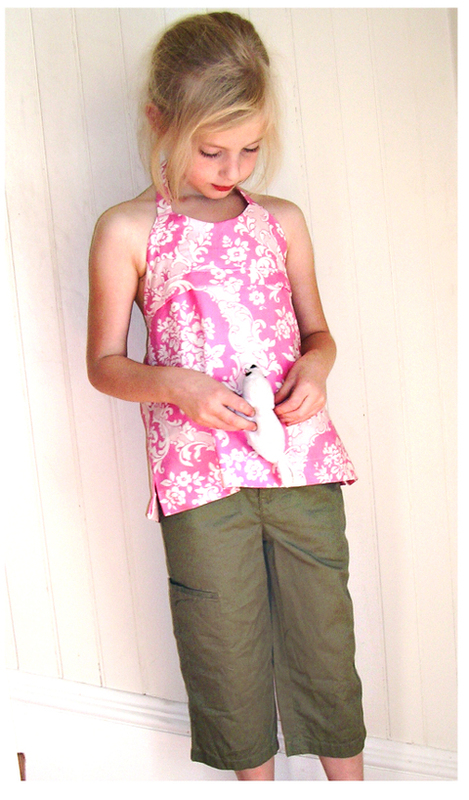 I'm converting all Ava's outgrown jeans into skirts for summer, a totally satisfying thing for me. Save money and make something pretty, yippee. I think the little halter top I made for A came out really cute, maybe I'll put a pattern up in the next couple of weeks. Thanks all for the birthday love, I spent it sewing and watching DVD's, that's all I did all day, which couldn't have made me happier. 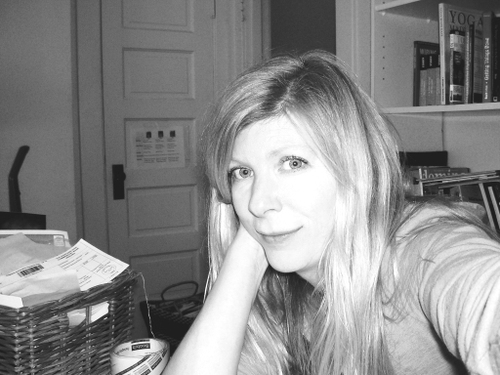 I really like that picture up there that I recently took of myself. My birthday is coming up on Friday and it dawned on me that it ain't gonna get any better from here on in so I might as well take some pictures. 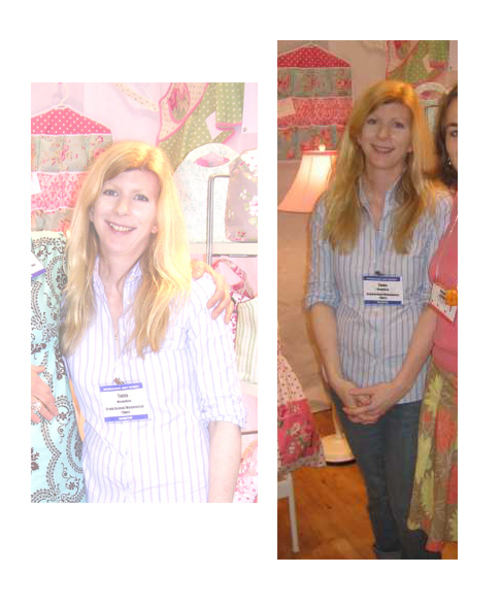 I really don't like any of the pictures taken of me at Quilt Market and is it possible that the migrane I was having during the whole thing actually temporarily melted the bones in my face or did it just feel like it, and, apparently, look like it? 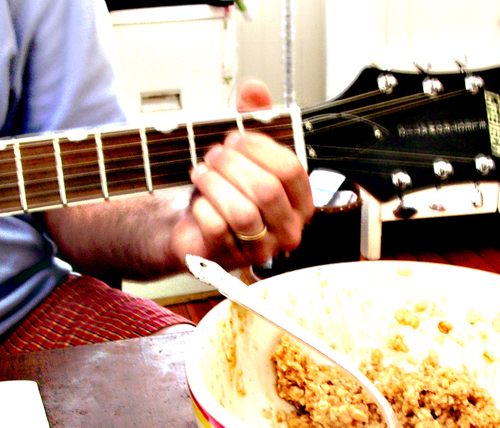 oatmeal and guitar make for a delicious breakfast, thanks honey. on a related topic, seeing my girl sing an Oasis song while my husband plays guitar is a really nice sight to wake up to, thanks again honey. 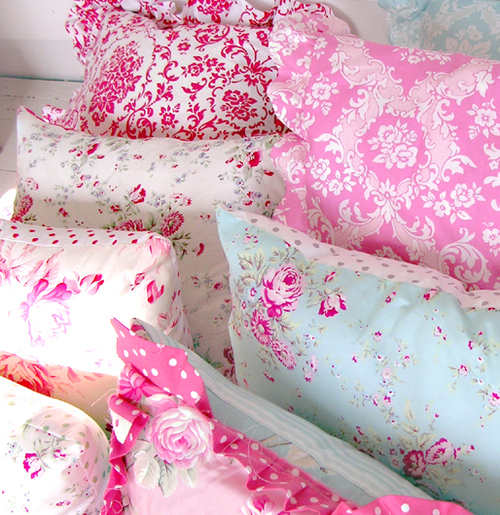 maybe I take too many pictures of pillows, do I have a pillow addiction or a pillow picture addiction? I am so bummed that my old sewing machine finally broke and I don't know if I should get a new one or have it fixed. the bath I took whilst listening to Van Morrison and drinking a good German beer was possibly the nicest thing I've done for myself in 2 years. that I might have to learn French before next summer. 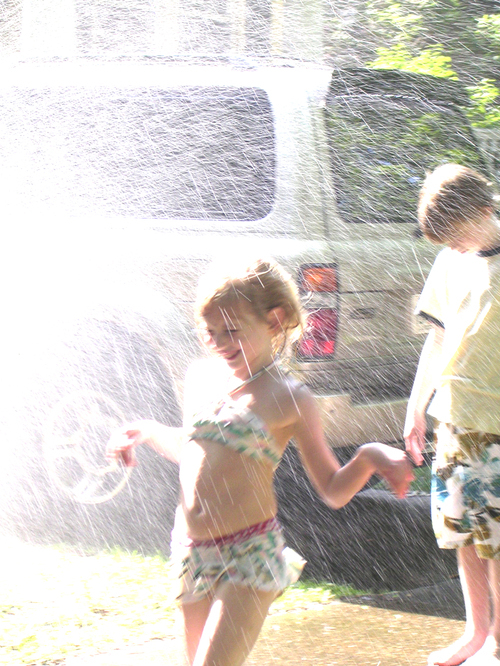 that the perfect Memorial Day is sitting on the porch watching kids play in the sprinkler whilst drinking Kosher Coke (because it has sugar instead of corn syrup like it used to be when I was a kid), eating popcorn and smelling the sweet, sweet scent of jasmine in the air.